Kafka, the great writer, thus problematize the relation between intellectual and physical labour, implicitly questioning the assumption that physical labour lacks intellect, and intellectual labour is done in a void, without a physiological substrata, without a body. Needless to mention, Kfaka provoked questions and interrogations related to what indeed the relation between our intellectual capacity and it’s bodily embodiment. In other words, he raised the age old unsolved problem of the relation between mind and body. ‘Men’ ? Kafka actually meant humanity. So, the question is how thousands of hours spent learning, practicing, preparing and performing craft — usually alone — lead back to humanity at some point? Somehow we learn to dig into us, learning what we are. More so, if you listen to Fakir Lalon Shah while you are doing your craft works. You must have remembered Prabartana’s old space where we had regular musical sessions organized by Nobopran Andolon. Once we are settled, we will bring back the marriage between craft and spirituality, the way you always knew us. Homo sapiens are strange species, deep down inside they are not Descartian at all, rather an unity of mind and body. It’s irrelevant whether the Many flows through You or Me. We are merely Names on this earth. Since Names are many, we imagine we are merely parts and individuated fragments, while the truth is we are only passing waves in the ocean of One making Many apearences.. If thinking disconnects us from society, from the One, crafts connect through the register of the Many, in our creative and meditating selves. Each of us is the signature of the universe where we always belong, through crafts, arts and spiritualty. Reading rooms in libraries and gathering together in coffee shops somehow compensate by letting us be physically together. But when we wear a handloom fabric or use a simple craft product, in the mood of meditation to be with the others, we are indeed in the community both physically and spiritually. Deep down in you the journey through crafts is the journey of One, but only to discover the Many. Or Vice Versa…. Be with PRABARTANA. 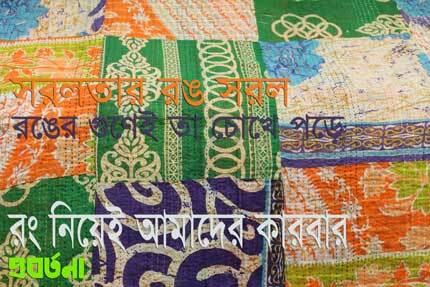 Love handloom fabrics and crafts of Bangladesh.